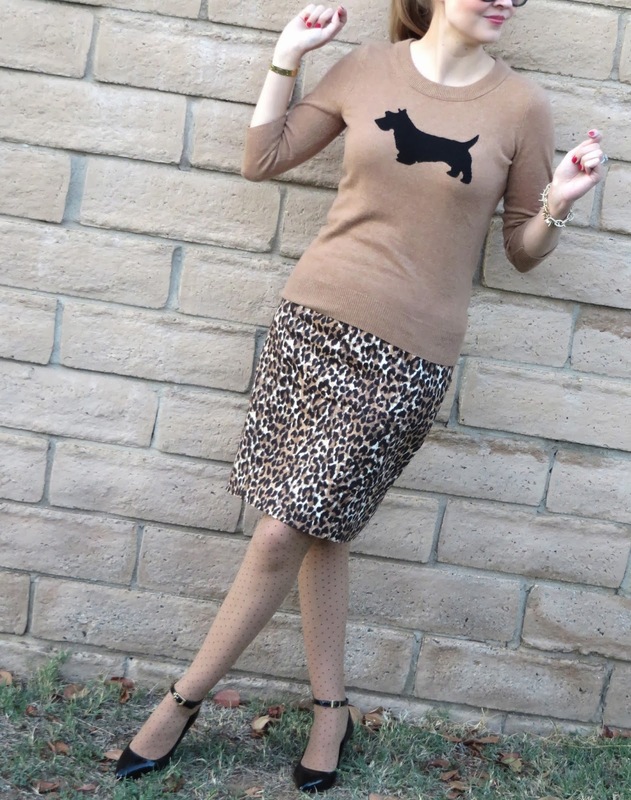 Hello Katie Girl: The Leopard and the Terrier? The Leopard and the Terrier? I never thought of combining leopard with an innocent little Scotty dog, but I think the Scotty is holding his own fairly well against the leopard! The idea for this duo came about when I came across a similar outfit on Pintrest and I thought: I have all of those pieces, why not give it a try? As I was blogging about this outfit, I looked back to my archives and realized that I wore this exact sweater here for the first time on the exact same day last year. I originally wore it with jeans and what else but a scarf made in Scotland, but I am glad that I was able to dig up a more creative and dressy way to wear this Scotty dog sweater. Scotty dogs are one bred of dog that I have always adored. (Okay so I love almost all dogs!) One of my elementary school teachers had the last name Scott and she was obsessed with the bred of dog that shared her name. She would knit all of her students these lovely wool gloves. I usually bought her some "Scotty" themed gifts for the holidays, perhaps stationary or an ornament. Later I fell in love with the videos the White House put out of Bush's Scottish Terriers, Barney and Miss. Beasley. I also have several Christopher Radko Scotty dog ornaments that adorn our tree. It's just so much easier to find Scotty dog themed things than anything having to do with English Springer Spaniels. Sorry William! Sweater: J. Crew Factory "Scotty Dog"
Ohhh Katie this outfit is just lovely - and the scottie is adorable to boot! Thanks! I thought the Scotty would be perfect for the holidays. I have this sweater and I have never thought about pairing it with leopard. So cute on you! Thank you Celle! I never thought about it either until I saw the combination on another blog.